On 12 July 2013, an Ethiopian Airlines 787 caught fire while parked on an apron at London's Heathrow Airport. There were no passengers on the aircraft at the time of the fire, and no one was injured or killed. The initial witness and physical evidence shows that this event resulted in smoke throughout the fuselage and extensive heat damage in the upper portion of the rear fuselage. The photo below shows that the fire burned through the top of the fuselage in the rear of the aircraft between the two rear doors and near the base of the vertical fin. 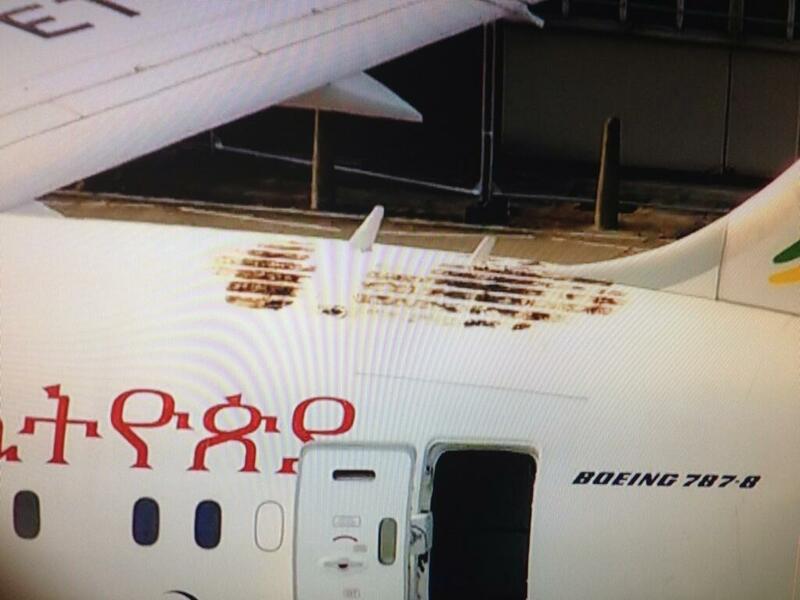 The aircraft had arrived from Addis Ababa, Ethiopia about nine hours before the fire was discovered. In addition to the AAIB, participants in the investigation include the FAA, NTSB, the Civil Aviation Authority of Ethiopia, Boeing, Ethiopian Airlines, and Honeywell International. Honeywell is the manufacturer of the emergency locator transmitter (ELT) used in the 787. The battery in the ELT is based on a lithium manganese-dioxide technology and not on the lithium-ion technology associated with the batteries that caught fire on two different 787 aircraft in January 2013. The fire was in the rear of the fuselage, and was remote from the areas of the aircraft containing the main battery and the auxiliary power unit batteries, the batteries associated with the grounding of the entire 787 fleet earlier this year. In the following July 15, 2013 interview on the South Korean eFM radio show Prime Time with Henry Shinn, Dr. Todd Curtis discussed several issues associated with the ongoing investigation into the July 6, 2013 crash of an Asiana 777 in San Francisco, CA, including speculation about the cause of the crash, the role of automated systems in the cockpit, and the NTSB investigative process. Many of the issues raised in this interview included questions about the 777 crash answered in a previous article.